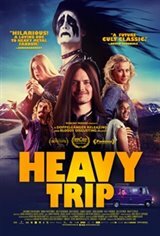 In this offbeat comedy from Finland, Turo is stuck in a small village where the best thing in his life is being the lead vocalist for the amateur metal band Impaled Rektum. The only problem? He and his bandmates have practiced for 12 years without playing a single gig. The guys get a surprise visitor from Norway the promoter for a huge heavy metal music festival and decide it's now or never. They steal a van, a corpse, and even a new drummer in order to make their dreams a reality.